It was no surprise that the world lost Leonard Nimoy today. He had been very sick for some time. There will no doubt be many reflections written about him in the coming days and some will of course mention the "Live Long and Prosper" hand symbol from Star Trek. Playing Spock in both television and movie versions of Star Trek, Nimoy's character used the hand gesture used by kohanim (Jewish priests) for his Vulcan salute. 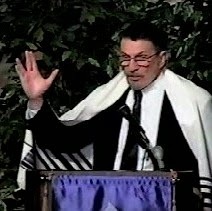 Leonard Nimoy created the Vulcan sign from his childhood memories of the kohen blessing the congregation in synagogue. Leonard Nimoy, as well as his character Spock, knew that people are more likely to "live long and prosper" if they're veg. I am so moved by this phenomenal interview. And I'm not even Jewish. This is a precious slice of Yiddish and American history. I had no idea he was Jewish, but I think it's so fascinating that he based the vulcan salute on Jewish religious practice. Thanks for sharing that video. Really neat. Great clip by the Center for Yiddish Books, a great center of I am a supporter and subscriber of their delightful publication. I had the pleasure of seeing Nimoy some years ago as part of ournJewish Book Fair. Nimoy published a book of photographs which was deemed too sexually controversial making. It necessary for the event to move from the JCC to one of the local temple. יהי זיכרו ברוך- may his memory be for a blessing.